Whether it’s a homemade strawberry shortcake in summer or a chef’s complex medley of sweets, dessert is the perfect ending to a meal. Most of us, even those who seldom indulge, have a favourite dessert. After all, sweet is one of the basic tastes and we seem to be hard-wired to like it. Yet while everyone has a taste for sweetness, not every culture enjoys a dessert course at the end of the meal. And desserts as we know them – the light sponge cakes, the ice creams, the steamed plum puddings – are neither as old nor as ubiquitous as many of us believe. Jeri Quinzio traces the history of desserts and the way they, and the course itself, have evolved over time. The story begins before dessert was a separate course – when sweets and savouries were mixed on the table – and concludes in the present, when homely desserts are enjoying a revival, and as molecular gastronomists are creating desserts an alchemist would envy. An indulgent read, for all those with a curious mind and a sweet tooth. 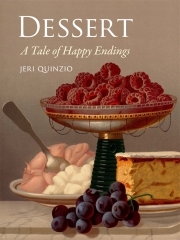 Jeri Quinzio is the author of Pudding (Reaktion, 2012) and Of Sugar and Snow: A History of Ice Cream Making (2009), which won the 2010 ICAP Culinary History award. She lives in Cambridge, Massachusetts.